This summer the teen camps began searching out secret swim holes beyond MDI… Can you identify this lake? Little Tunk. The teen campers found this hidden gem in Sullivan. The nicest sand beach in all of Hancock County. Requires a mile long hike through a lovely forest trail. Can you guess which team won the “Last Day of Camp” Capture the flag game? Can you guess how many eggs our chickens produced this summer? Campers collected 430 eggs from our 12 chickens this summer! Can you guess what year this photo of Mike was taken? Mike hasn’t actually changed that much over the last 18 years… we believe this photo was taken at the 4th of July parade in 2000. Can you name the counselor Cece is racing? 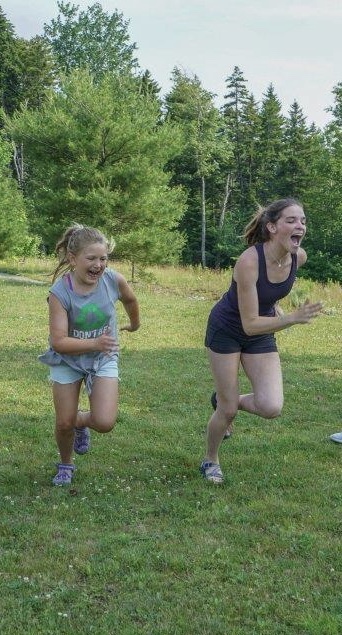 Cece is racing camper-turned-counselor Delaney. Can you name another good use of the hill? Guess how many animals Kyle brought into the nature cabin this summer? “The only resident animal this summer was a ball python (boots), but we had: Red Eft (newt), Redback Salamanders, Pickerel frogs, Wood frogs, Leopard frogs, Deer mice (live trapped in back room and humanely relocated - kids never touched them to avoid possible disease transmission), Midland painted turtle (discovered on road, released the same day), Dragonflies/ damselflies/ FishFly, Harvestmen, Various Arachnids, a multitude of insects, including Luna Moths/ Tiger Swallowtails, and an invasive fire jewel beetle. Some lost animals rescued from inside or around the cabin, including a nuthatch, female sapsucker, juvi hummingbird, and a few sneaky chipmunks and red squirrels. Also lots of songbird visitors at feeders. Goldfinch, Purple Finch, nuthatch, Junco, Blue Jay, Mourning Dove, Sparrows, Chickadees, a rando Crow”. 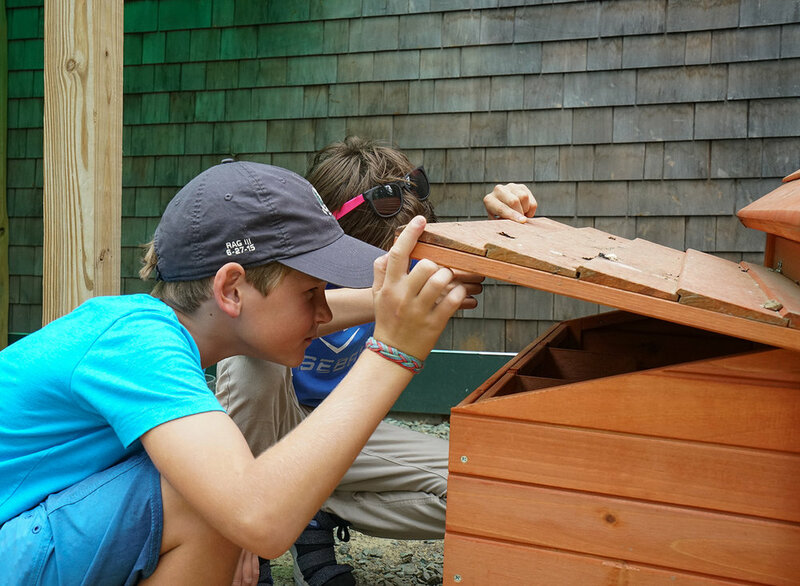 Can you guess how many forts were built in the woods this summer? By our count, campers constructed 46 forts of various sizes and configurations this summer.